Website: http://www.crc-rep.com/research/enterprise-development/precision-pastoral-management-tools or call Sally on 8951 8144. A great turn-out of local beef producers, stock agents, politicians, NRM and local department staff were at the Undoolya Field Day on the 3rd November. All were in attendance to learn more about the Precision Pastoral Management System (PPMS), which has been under development over the past five years. The research and development of this technology has been part of a collaborative research project that the DPIR has had with the Cooperative Research Centre for Remote Economic Participation’s (CRC-REP). Attendees spent the morning of the field day listening to presentations from beef industry leaders on the economic and land management challenges beef producers face, with the PPMT Project team then demonstrating how the PPMS can be used to address some of these challenges. The Hon. Ken Vowles MLA, Minister for Primary Industry and Resources addressed the crowd, as did Chansey Paech MLA, both of whom enjoyed meeting with and talking to local producers. After lunch the attendees headed out to Undoolya’s Number 5 paddock to see the RLMS (automated weighing system) in action. This provided the group with the opportunity to talk with Tim Driver from Precision Pastoral and Ben Hayes from Undoolya Station about the practicalities of installing the RLMS and how to train the cattle to being automatically weighed and drafted. On returning to the homestead, attendees were were run through how they could do their own cost-benefit analysis. A panel run session allowed the group to raise final questions to the presenters and Nicole and Ben Hayes (Undoolya Station). This was the last of five field days delivered across Northern Australia by the PPMT Project team. 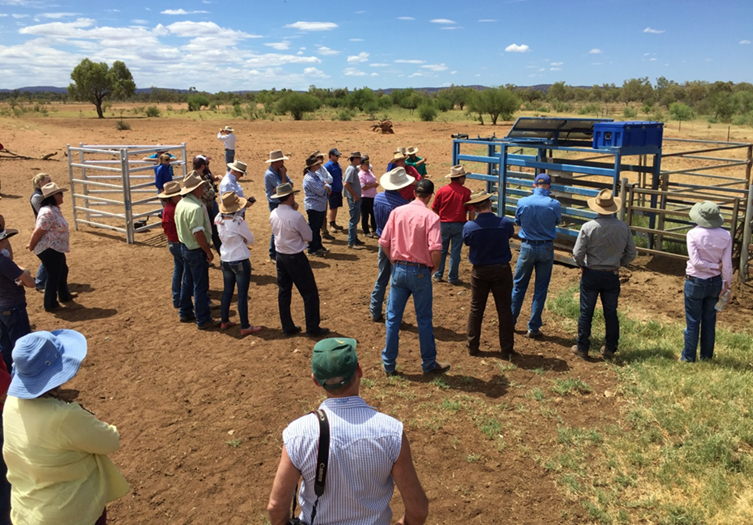 It was very fitting that the final field day was held in Central Australia where the concept for Precision Pastoralism was born. The opportunities that this type of technology offers beef producers will only continue to grow, as many in the industry view that the next productivity gains will come from agricultural technology and the use of big data.